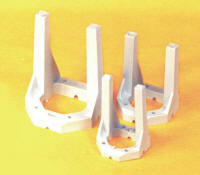 These engine mounts are specially moulded from glass reinforced nylon and are many modeller’s first choice. They are tough and rigid. The grooves in the back can be used to house a nose wheel leg if required. available in various sizes these glass filled nylon mounts cater for most sizes of engine and provide a strong but resilient mounting. Four self tapping screws are provided.